Our training educates IT professionals on Silver Peak technology and products and provides background information on key SD-WAN (Software-Defined WAN) fundamentals. We offer technical certifications at the Professional and Expert level, and training courses to help you obtain them. Instructor-led training courses are also offered as self-paced online courses. Intructor-led courses can be attended in person or remotely via WebEx. All classes are free of charge. Are You a Partner or Reseller? We offer certifications for you through the Silver Peak Partner Portal. We offer small class sizes with dedicated instructors who have extensive networking backgrounds and filed experience. Sessions are specifically designed to foster detailed discussions on specific areas of value and interest. The SPSP certification is based on the EdgeConnect products and SD-WAN technologies. You can earn this certification by attending the Deploying SD-WAN Technologies (DST) course. The instructor-led Deploying SD-WAN Technologies course is packed with 12 hands-on labs over a two-day period (10 in the online version). Each student will install and configure a Silver Peak software-defined WAN with an Orchestrator and EdgeConnect appliances in their own individual lab network. You must pass the SPSP test after attending the DST class to earn your certification. You must pass the SPSP test after attending the DST class to earn your certification. The SPSX certification extends the foundation knowledge of the SPSP into more complex deployments of EdgeConnect SD-WAN appliances. You can earn this certification by attending the Advanced SD-WAN Deployments (DST) course. The Advanced SD-WAN Deployments (ASD) training consists of a jam-packed single day of lecture and hands-on lab exercises with Silver Peak’s Unity Orchestrator and EdgeConnect SD-WAN appliances. Hands-on lab exercises give you experience with advanced implementations, including out of path implementations using BGP, WCCP, PBR and VRRP. and support and troubleshooting of an EdgeConnect SD-WAN. The course includes a deeper examination of traffic flow and interface behavior. Students attending this course should have already completed the DST course. Silver Peak offers small class sizes with dedicated instructors ensure maximum exposure to the right educational material. The SPX program is specifically designed to foster detailed discussions on specific areas of value and interest. All Silver Peak instructors have extensive networking backgrounds and field experience working hands-on with real customers and real deployments. Silver Peak instructors have also completed instructional training and are current certificate holders themselves. Students attending this course should have already completed the DST course. Prior completion of DST (online self-paced or instructor led) is recommended for best results. The Designing SD-WAN Networks (DSN) course is for anyone who plans to design, build, and/or size Silver Peak SD-WAN solutions. This course teaches Silver Peak SD-WAN network designers proper design techniques, reference architectures, and best practices. Using lecture, discussion, group exercises, and labs you’ll gain a better understanding of overlay design, traffic shaping, matching appliances and licensing to network requirements and planning a rollout. "This may have been the most pratical and most informative pair of IT training courses I've taken in the last 15+ years." "I actually envy your training! Tim is one of the best trainers I've had the pleasure to get instruction from." 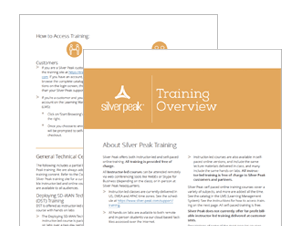 Need Instructor-led Silver Peak Training Delivered Onsite at Your Company? Silver Peak doesn't offer this directly, but there are Certified Silver Peak Instructors (CSIs) that are available to deliver the same great training courses you get from Silver Peak. Cavell Group, a global company with headquarters in the Netherlands, is available to deliver training at your site. Contact them at training@cavellgroup.com for details and pricing. Silver Peak Systems reserves the right to make changes to the content of any of our courses, course location, course dates, or to cancel a course at any time without notice or liability. Silver Peak Systems shall not be responsible for any incidental or consequential loss including reimbursement of travel related expenses incurred. Silver Peak Systems will endeavor to give enrolled students as much advance notice as possible of any change to their enrollment or selected course. In the event you must cancel your course registration, please contact the Silver Peak Training Team.